Here is a lovely winter lyric (c. 1310) in its original Middle English spelling, followed by a modern English paraphrase. Of this worldes joie, hou hit goth al to noht. Alle we shule deye, thah us like ylle. Ant shild us from helle! For y not whider y shal, ne hou longe her duelle. Winter awakens all my sorrow; now these leaves grow bare. Often I sigh and mourn to think of this world’s joy, and how it all goes to nothing. Now you see it, now you don’t — as though it had never truly been. Many men say this, and it is so: everything goes except God’s will, and we all shall die, though we don’t like to think so. All the grass which grows green, now fades altogether. Jesus, help us understand, and shield us from hell! For I don’t know where I shall go, nor how long I shall dwell here. An enclosure surrounds a farm comprising a sheep pen and, on the right, four beehives and a dovecote. Inside the house, a woman and a couple of young man and young woman warm themselves in front of the fire. Outside, a man chops down a tree with an axe, bundles of sticks at his feet, while another gets ready to go inside while blowing on his hands to warm them. Further away, a third drives a donkey, loaded with wood, towards the neighbouring village. 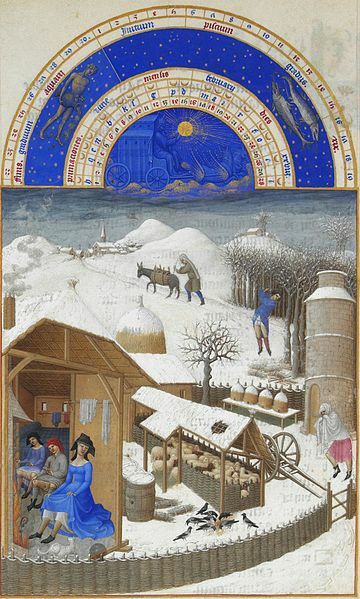 This entry was posted on January 12, 2017 by Vox Populi in Art and Cinema, Environmentalism, Poetry and tagged Limbourg brothers, Medieval English poetry, Tres Riches Heures du Duc de Berry, Winter poems, Wynter Wakeneth Al My Care.